A raven cawed and wheeled in the sky above Kate. Now almost at the end of her journey, she followed the raven’s flight to the towering gateway of London Bridge. Along its ugly, overhanging spikes, more ravens returned to roost. Their wings fluttered and flapped in short bursts of flight, and opened the morning to horror. Black wings beat amongst white human skulls. Amongst death. Silence fell, heavy like a shroud, before knifed open by a new disharmony. One raven shrieked, its beak gaping wide apart. Bluish-black wings fluttered and opened wide, and thrashed the air with power. The bird cawed again, its spread wings catching the wind in the dull sky, before swooping down to claim the fresh dead upon the long spikes. Trembling, Kate found herself unable to take her eyes away as the bird pecked and tugged, tearing at bloody flesh. Dark clots of blood oozed thick and worm- like from ripped skin. Other scavengers alighted near the feasting bird. Crouched upon the bloody head, the raven screamed in warning, in possession. Its sharp beak scraped against bone and delved into grisly eyeholes. The bitter, cold wind brought down to Kate the smell of decaying flesh, fecund on this graveyard wall. Kate swallowed down bile, tasting vomit in her mouth. Wherever Kate looked, right or left, black, empty eye sockets stared back at her. Eye sockets of the dead. Kate shut her eyes briefly and prayed: God in Heaven, forgive them the sins that brought them here. Keep safe their souls. She looked up again at the cast-off shells of these poor souls while, at the same time, the living eyes of the ravens glinted down to her with coldness, aggression, arrogance. Robins, doves and pigeons flocked beside the meat-eating birds. Their coos and chirps punctuated the harsh, punctuating caws of the ravens. But that didn’t blunt the nightmare. Kate lifted her chin, tightened her mouth and stared ahead. Why does he continue to smile and speak so gently to me? She desired none of his friendship. Very soon, Kate would have no more need of him. Once he brought her to the court, she would bid him farewell and thank God for it. She hoped the farewell would be for good. Beginning the journey over the bridge, Kate bent to soothe nervous Rachel, her thighs feeling the quiver of the horse’s muscles. The horse snorted and neighed, her walk a jittery dance that tried to shy away from the press of women, men and children. Most of them made their way across the bridge by foot, but a few also rode like her and her stepfather. With Rachel at last reassured and no longer threatening to balk at the crossing, London again captured Kate’s attention. Over two years ago, she had come with her grandmother to London from Rochford inland by water for her aunt’s summertime coronation. During the two weeks she stayed with her kin, she continued to travel by water in the Boleyn’s stately barge, going up and down the river with her grandparents, from one destination to another. This time her mother took it in mind to show that she, too, had the Boleyn pride, insisting that Kate journey to London through the only means that she and Stafford could afford: riding the horses they owned. Now the city of London seemed to reveal itself to her for the first time. Their way to London Bridge had taken them through streets both wide and narrow, the narrower streets outnumbering the wide. Travelling down the narrow streets, Kate had looked up to houses that jutted out and cast them into dark shadow and made the streets seem narrower still. Their occupants yelled to one another from their homes, tossing slops and the contents of their privy pots upon people rushing by. Heady smells overcame and confused her senses, one moment vile, making her grab the pomander hanging on her girdle and bring it to her nose, the next appetising. The cries and songs of men and women selling their wares. So many people, young, old, rich, poor. Her embarrassment was complete when her stepfather gazed over his shoulder and laughed at her. The way at last open before her, Kate dug her heels into Rachel’s sides, quickening her to a canter. I must be close to reaching Greenwich Palace and the end of my journey. So close to reaching an aunt who never laughed at her, or treated her like a foolish child. 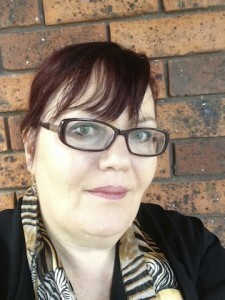 Wendy Dunn is an Australian writer who has been obsessed by Anne Boleyn and Tudor History since she was ten-years-old. 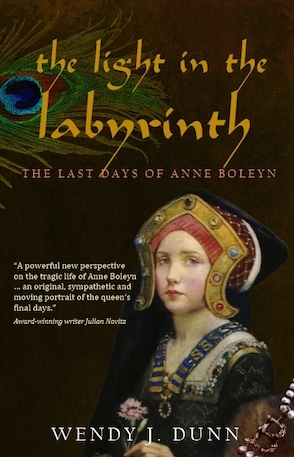 She is the author of two Tudor novels: Dear Heart, How Like You This?, the winner of the 2003 Glyph Fiction Award and 2004 runner up in the Eric Hoffer Award for Commercial Fiction, and The Light in the Labyrinth, her first young adult novel.